Abante Marketing is the area’s premier screen printing, embroidery, and promotional products supplier. Whether it’s corporate apparel for a trade show or custom t-shirts for a company picnic, Abante Marketing is here to meet your needs. Our dependability and professional customer service set us apart. Our state-of-the-art embroidery machines can create different textures, line weights, and shapes to create a fully customized design in minutes. Employee uniforms, company apparel, and custom bags are just some of the many products that can be embroidered by the Abante team. Promotional products give potential customers a little bit of your business to take home with them. They can be useful for a number of business models and company types as a way to stay fresh in your customers’ minds. From pens to coffee mugs to drawstring bags, we’ve got your promotional materials covered. 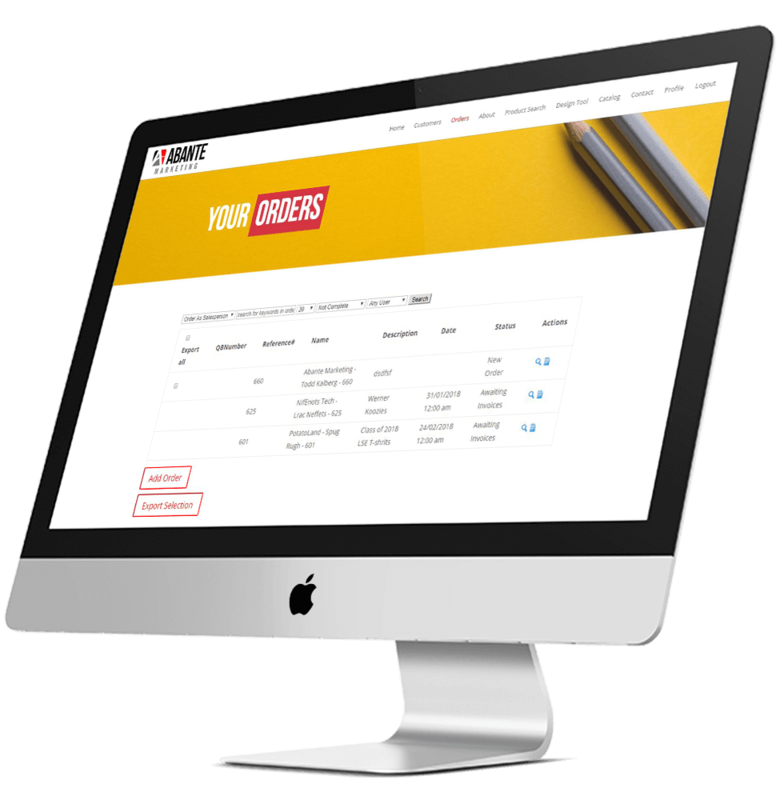 Our online customer portal tracks orders, saves customer data such as shipping locations and billing information. It’s easy to use and designed for your convenience. Click the link below to sign into your account! By creating a team of professionals we’ve made a name as one of the premier screen printers in the Midwest. The size and professionalism of our team means that we can take any project, large or small, and get it done on time, on budget, and on brand for your business. Our branding solutions team will even search through products for you, ensuring you’ll get exactly what you need. If you have questions about our products or capabilities, call or email us by clicking the button below. Our list of high-end national brands encompasses all aspects of promotional marketing. This ever-growing list of brand name products means you’ll never need to waste time shopping multiple product sites again. Check out some of the popular brands we work with to make sure you’re getting the top of the line for all your marketing needs. Abante Marketing has been a fantastic company to work with over the years. They are always responsive to our... read moreAbante Marketing has been a fantastic company to work with over the years. They are always responsive to our requests, easy to work with, and extremely good at paying attention to detail. I have worked with other companies in the past and rarely were orders correct. Abante gets it right - every time! My first experience with them was buying koozies for my wedding years ago. What impressed me about them at that time was how well they treated me knowing I was a small project and probably not going to be a repeat customer. Since then I have worked with Abante for apparel needs for a non-profit board I serve on as well as for my work related t-shirt, staff apparel, and other marketing needs. They continue to be phenomenal to work with and always attentive to our account. Great owners, great staff, top quality. Everything from the personal attention from the sales staff to the highly skilled detail of the artists. I... read moreOutstanding experience! High quality and on time. Shirts are as expected. Printing on shirts lasts! Trevor is great to work with.